If you haven’t seen Scandinavia during winters, you are still to experience the real beauty of Europe’s most magical corner. Winter in Norway, Sweden, Finland and Iceland is the best time to witness Aurora Borealis and get a taste of genuinely Scandinavian activities like reindeer sledding or visiting Santa in his estate in Lapland. 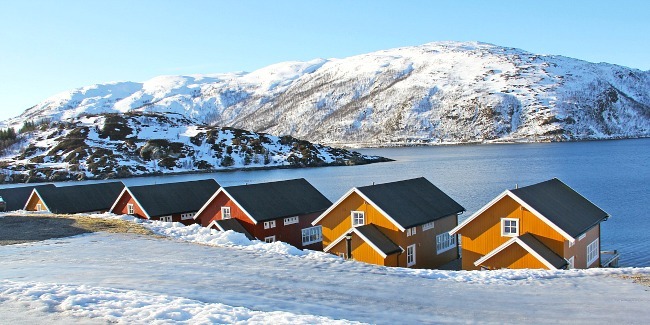 Here’s our list of 5 Things to Do and Places to See in Winter Scandinavia. The Northern Lights is a unique natural phenomena of red, green and yellow lights literally dancing in the sky. It’s caused by cosmic rays, solar wind and magnetospheric plasma interacting with the upper layers of the atmosphere. October to February is considered the best time to witness Aurora Borealis and some of the best places to do that are Abisko Aurora Sky Station in Sweden, Rovaniemi region in Finland and Lofoten Islands or Tromsø in Norway. One of the most popular and exciting winter activities in Scandinavia is dog or reindeer sledding. It can be found almost anywhere, but the most popular spots are the Santa Claus village in Finland and Tromsø in Norway. Ice hotels are among the highlights of Scandinavian winter. Each year they are built from scratch using big ice blocks. Usually ice hotel owners attract well-known designers to participate in the process and as a result travelers get a unique opportunity to spend a night or two in a frozen masterpiece, sleeping on an ice bed covered with reindeer skin and a special thermal blanket. Scandinavian winter already sounds like a lot of fun, but there’s even more to explore! One of the most unforgettable experiences is joining a cruise across the Arctic Circle to visit an Art Nouveau town of Alesund, see the magnificent Trollfjord and meet indigenous Sami people nearby Kirkeness. Did you know that Santa Claus actually lives in his own estate in the Finnish Lapland? Of course, you won’t find elves and fictional characters here. But sending a postcard from the official Santa Claus office in Rovaniemi is a childish dream come true, isn’t it? Besides, you can dine in a Michelin restaurant and do some souvenir shopping along the way. As you can see travel to Scandinavia is well worth it! Apart from all unique winter activities, you will also enjoy less crowded museums and art galleries. But remember, if you would like to take a winter tour to Norway, Sweden or Finland, make sure to book it in advance due to limited availability!